Prices are determined based on the weight of raw fiber in ounces, prior to processing. There is a 3-ounce minimum charge per fiber order. Fiber weighing less than 3 ounces will be charged as 3 ounces. 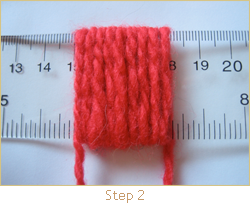 The thickness of yarn is measured using a method called WPI, or Wraps Per Inch. 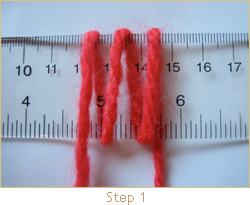 To determine the thickness of any yarn, simply wrap the yarn around a ruler or a large needle. Push the yarn together evenly so that there are no spaces, and count the number of wraps in one inch. You can also count the number of wraps over two inches, and then divide in half for a more accurate measurement. Sport weight is thicker than finger weight and is used when durability and extra warmth are desired. Socks and booties are ideal for a sport weight thickness. 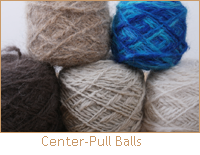 Finger weight is the most common strength and thickness of hand-spun fiber. It is incredibly versatile and can be used for almost any project. Finger weight can be used for hats, mitts, and sweaters. Lace weight is classified as a fine and delicate thickness used for ornate and detailed projects like a lace scarf, shawl or wrap. Ball Winding: If you don't have a ball winder at home this service can save you a lot of prep work. 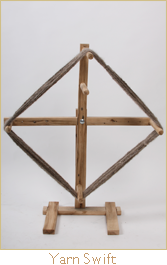 You will receive a professional center-pull ball, wound on our jumbo ball winder. Add Color! Ever wonder what your pet would look like in different color? Choose from a variety of colors, even mix-n-match. Add Sparkle! We can add a subtle dramatic shimmer to your fiber. A variety of shades are available. Blend It! If you're worried about your chiengora being too warm, or want to tone down the halo effect, why not try blending it with wool? By partially blending your fiber with wool you add elasticity, minimize halo effect, and reduce the warmth of your yarn. 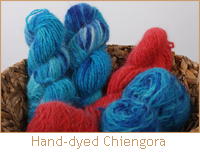 Blending is a great alternative if an increase in yarn output is desired. If you only have a small amount of fiber, blending can help it go a long way by doubling your hand-spun output. Halo: the fluffy appearance of fibers such as chiengora and angora. Halo effect increases with wear. Depending on the condition of raw fiber received, the following services may be required. Our initial inspection will allow us to determine the steps necessary to ensure the best quality fiber possible. Opening: You've left your dog hair in plastic bags for the past 4 years and now your fiber has felted into little clumps! 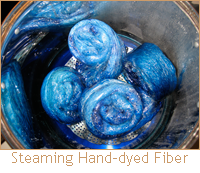 Opening is the process of preparing matted fiber for hand-spinning. Pre-Wash: We request that raw fiber be shipped as clean as possible, however, sometimes that’s not always the case. Our pre-wash system is designed to get even the dirtiest fiber clean. Ideal for pure white fibers and sheep’s fleece by helping to ensure the whitest possible outcome.